Those are Ian Hunter’s lyrics. 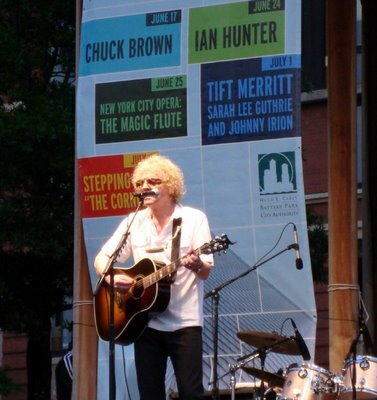 Ian Hunter is a British 70’s B-list glam rocker who was the lead singer/songwriter for Mott the Hoople. They had a big hit with All the Young Dudes, which was written by 70’s A-list glam rocker David Bowie. Andy Mackay, saxophone player from 70’s (A? B? )-list glam rockers Roxy Music played the searing sax solo on Mott the Hoople’s hit All the Way From Memphis. Hunter also had a fairly successful solo career. 80’s hair band Great White scored a minor hit with a cover of his Once Bitten Twice Shy which was, not surprisingly, not as good as the original, and his Cleveland Rocks was the title song for The Drew Carey Show. When I was a teen, Mott the Hoople was one of the bands I idolized. My fascination with all things British started at an early age. Additionally, Hunter has incorporated his love of New York City into several of his songs, which has endeared him to me even more as the years peeled away. Recently, I got to see him perform at a free outdoor concert in Manhattan. It was part of the River to River Festival. The Festival is an annual NYC summer event that offers free concerts, plays and readings in parks along the Hudson and East Rivers. When Mott the Hoople was touring, I was too young and too broke to ever see them perform. Watching him perform Central Park n’ West with Manhattan as the backdrop made my 15-year old glam-rock heart sing. Just look at him. The glam is long gone but the music remains. I love him too. And David Bowie was what really cemented my Anglophilia. The banner behind him advertises Raleigh-to-NYC transplant Tift Merritt! I’m not a big fan, but I got to see her perform once in her earlier days and at her best, she’s a real siren.Interestingly, it appears she’s been paired with music royalty: I saw Woody’s Guthrie’s granddaughter, Sarah Lee, at a the local Festival of the Eno in Durham, NC about 8 years ago, also noted on the banner. Sarah Lee is an example of how artistic talents cannot be passed along to the next generation . Perhaps hard work is paying off these days for her. I believe I may still have some Mott the Hoople albums hidden away somewhere in the garage gathering dust.I cannae say that I was ever really into the Glam scene, perhaps just a wee smidgen of early Freddy Mecury maybe. Leah: You should have come to his show! It was in that park just adjacent to the World Financial Center and it was free! free! free!JZ: All those shows on the banner look worth the time. And the price is right.Jimmy: I cannae think of ANYONE less likely to have followed the Glam Rock movement than you. But from a basement in suburban Ohio, it looked… well… pretty glamorous. These free concerts are the very reason I want to visit New York. Aye, guv’nor! The t’ings we’ll admit to on these blogs, eh? Heart of a glammer. Never woulda thought it.I’ve barely heard of any of the musicians you’ve mentioned in this piece. I always got “Mott the Hoople” confused with “Mott’s Clamato Juice”.Seems like the Brits have been coveting America ever since the War of Independence, eh?I, meself, am descended from British emigrants to Canada, on me da’s side. Third generation Canuck, I am. Mott the Hoople was my senior year pysch teacher’s favorite band.”All the Young Dudes?” he would ask us. “You don’t know that?”He was about a decade older than we were and we thought he was incredibly lame.It’s uplifting and scary to watch old dudes sing the songs that made them back in the day. I had tickets to a Mott show way (way) back in the day, but they canceled. Which pissed me off because Aerosmith was supposed to open, and I hadn’t seen them live yet. That must have been 1974? Somewhere around there. I got to see Aerosmith open another show a few months later, but Mott never came back. Sid: Well, then, you’d better get here in a hurry. The outdoor concert season is almost over!Rob: I got sucked into Glam Rock! That world was the antithesis of Cleveland. And I was a teen. What was I suppose to listen to? Mozart? Annie: I can always tell when they’re singing for a paycheck and without any passion. Mr. Hunter seemed be genuinely enjoying himself.mjp: You’re in luck! I just found out there’s a Mott the Hoople reunion show at the Hammersmith in London in October. With Mick Ralphs! This is probably your last chance. Ellie: Well, yea. Who doesn’t love Brits?AFM: Real funny. You’ll be here someday, buster, and it’ll be sooner than you think.Daisy: That’s the best. Some guys never lose the ability to entertain. Sorry to report that Mrs. Wife and I saw Blondie about a year ago and it’s OVER for them.